Where no Janitor has ever wanted to go before. When you think of the old point-and-click PC adventure games, you normally think of King’s Quest, Grim Fandango, Leisure Suit Larry and the Monkey Island series. Only a small amount of us old school PC gamers remembers the Space Quest series which is now considered to be nothing more than a cult classic. The Space Quest series was one of Sierra’s big 3 Adventure games back in the late 80’s early 90’s along with King’s Quest and Leisure Suit Larry. The Space Quest series was created by Scott Murphy and Mark Crowe. The Space Quest games by their design was meant to be a comedy adventure series making spoof at popular sci-fi icons of the past (terminator, aliens, star wars and star trek). These two went on to being known to their fans as the “Two Guys from Andromeda” and sported fake Mohawks, Disco Glasses (looked more like the 3D glasses) and pig snout. 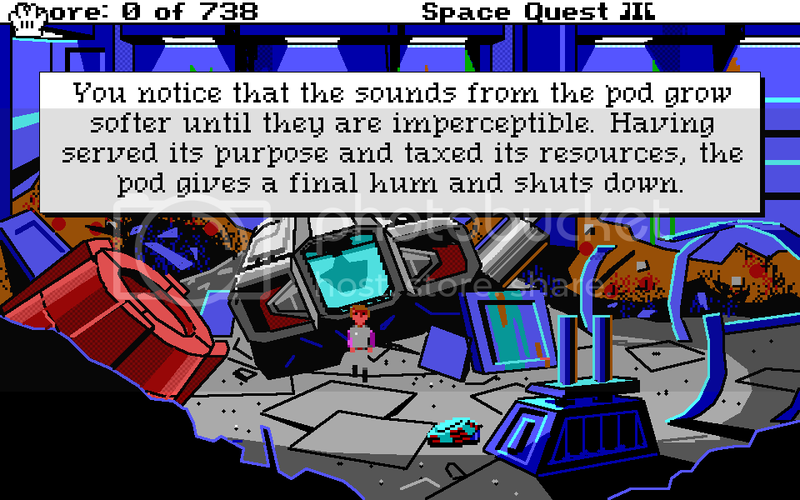 The Space Quest series followed the heroic mishap adventures of Roger Wilco. He’s a bumbling janitor who somehow manages to find himself in the middle of everything, no matter how big the universe is. The Space Quest universe is a very vast one at that. You will meet all sorts of aliens (like Fester Blatz), make new friends, movie android take-offs (Arnoid the Annihilator) and encounter evil re-occurring nemesis (Sludge Vohaul). Space Quest started off as a typing graphical adventure game. The first 3 space quest games involved typing but after a remake of Space Quest 1 (1991) the series adopted a point and click interface. The typing interface for Space Quest I and II was what pretty much kept you alive in the game. You had to type fast because the game ran on real time (think final fantasy VII) and only giving you a chance to rest once in awhile to contemplate your actions. Space Quest 3 is where the typing interface actually changed a bit. Instead of being forced to type at god’s pace the action now freezes while you type in a command. In 1991, Sierra decided to change not only the look of the game but the game play itself. Updating the series’ graphics to the 16bit era and now a new point and click interface which was introduced in the 1991 VGA remake of Space Quest 1. Shortly afterwards Space Quest 4 was released and the quirky adventures ensued. After Space Quest 4, Murphy left Sierra and a couple years later, Mark Crowe worked on and released Space Quest 5. Unfortunately SQ5 didn’t have the same impact that the previous 4 had. Around 1996, Sierra was contemplating on abandoning the Adventure genre since lately, since the popularity of the genre was falling. Even with popular titles at the time like Sam and Max hit the road and Full Throttle, the genre was in a funk. Sierra was willing to give Space Quest another go however and green lights work SQ6. 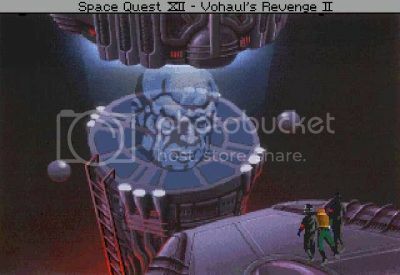 Space Quest 6 was the first in the series to feature voice acting and new game designer, Josh Mandel. Josh Mandel later on becomes known as the “Third guy from Andromeda” and gets help from Mark Crowe to finish developing the game. Unfortunately SQ6 was the least popular of the bunch mainly because it just didn’t have the same feel or spark that the previous titles had. In 1997, Mark Crowe then started development of SQ7 with the help of Leslie Balfour, but the game was ultimately canned. The game was later pitched to Sierra execs in 1999 but was shot down due to lack of demand and support. After the poor popularity of SQ6, Sierra finally decides to pull the plug on all their Adventure game franchises. However, just last year, Sierra released a new Leisure Suit Larry game and allowed the development of a King’s Quest fan game. Also hiding the in mists of the internet are several Space Quest fan games including a 3D Space Quest 7 fan game. And while the Sam and Max 2 game was cancelled, there are still talks going on about a game from the creator of the popular comic. With the recent surge in Adventure games, there might be a chance that one day we will have a new Space Quest game. Hell, I know I want a Space Quest 7. NOTE*- At the time of posting I also found a fan made FPS remake of Space Quest 1. You're showing your age Hubbs. I was a janitor peeing in the sand once too. Boy, those were good times. HAHA, I'm still rather young.